A fun little Christmas design for you today! My card starts with a regular A2 card base in SU Bermuda Bay. Next comes a layer of white card stock that’s been dry embossed in a snowflake pattern. Then I’ve taken a piece of dotted designer paper, distressed it and inked the edges in Bermuda Bay. My tree has been cut out of a coordinating designer paper with a Sizzix die and adorned with Recollections Glitter Adhesive Dots. Don’t you think they look like snowballs? Fun hmm? My embellies include hand-dyed seam binding, again dyed with the Bermuda Bay, some baker’s twine in a coordinating color, a little pennant for the sentiment and a fun button treatment. I’ve taken a clear, flat button and added a red-liner tape dot. Then the red baker’s twine was wound around to make sort of a lollipop look. 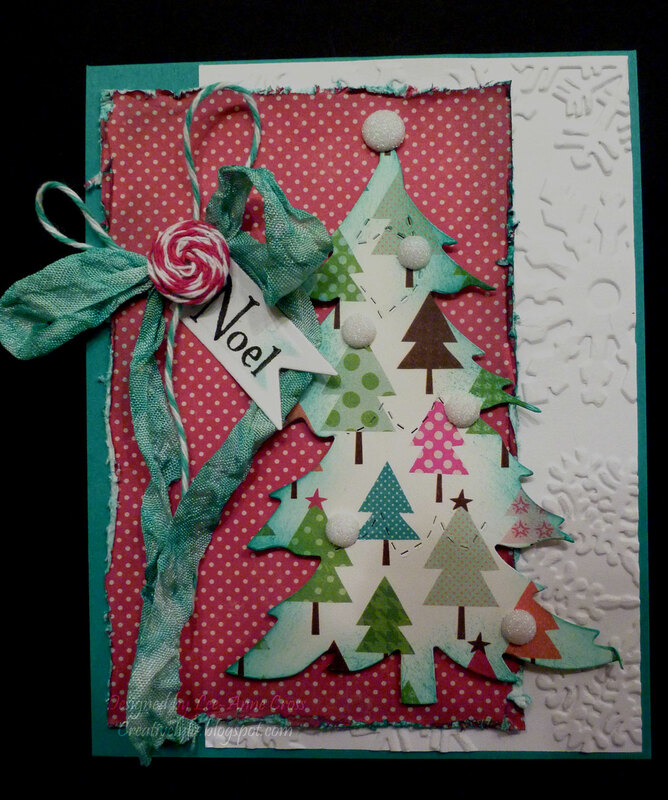 It’s all been attached to the card with my favourite glue – Crafter’s Pick. Previous Previous post: Make Merry!